How do we motivate teens to take little actions that offer big results? 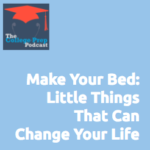 Megan reports in about a book she read recently that has lots of great advice for teens: Make Your Bed: Little Things That Can Change Your Life…and Maybe Even the World by Admiral William H. McCraven. Even though it’s written for grown-ups, Megan sees the ways that this little book could be an inspiring gift for teens, or be a great conversation starter at dinner. Start the day with a task completed. You can’t go it alone. Life’s not fair. Drive on. Failure can make you stronger. To check out the book yourself, you can find it here.